The thick, steel door slammed shut the moment Paul hit the ground. He rolled onto his side and opened his eyes to look back at where the men were just standing. The men who brought him here, against his will, and trapped him in this cage. They knew about his gift. Paul knew they knew. They just wouldn’t admit it. But he knew. Thick, white cloth lined every wall in the small cell. Whether to protect its resident from itself (as They say) or to muffle his screams, Paul wasn’t sure. What he was sure of, however, was that he had to get out. But you’re safe here, a voice cooed softly, as if to easily sooth him into his new residence. He recognized the voice immediately and curled his lip up in disgust. Tentatively, Paul stood up. His left knee was still healing from an accident the night before, and putting any sort of weight on it shot shocks of pain through the rest of his body. But he endured. He slowly stepped towards the exit—the metal door that had been painted white to match the walls. A small window, smudged with years of fingerprints and airborne grime looked out into the hallway. Below it, a horizontal passageway held closed by a piece of metal on a hinge probably allowed the guards to throw food in to their prisoners. Paul reached his hand in the slot and pushed the metal covering upwards. He determinedly repeated himself over and over again, but no one came. Eventually, the pain in his knee was too much and he sunk to the floor and fell to his side, where he could no longer reach out the food slot. So much for being able to handle yourself. Why don’t you make him? A second voice began to taunt, this one female. If you’re so tough, Paul, why don’t you make him shut up? Huh? Yeah, Paul. Make me shut up. “Give me a pen and I will,” Paul muttered. What’s that, sweetie? You’re mumbling; we can’t hear you! Paul climbed to his knees and pushed the slot cover open again. “Hello! Please, someone come! I’m not supposed to be here! I have to get home, and fast!” His thoughts were racing. He tried to articulate them, but what came out was a long, piercing scream that echoed along the plain, white walls of the hallway. Oh, that sounds nice, Sel said smugly. The hole. I bet that’s where you want to go, right Paul? The footsteps slowly clunk, clunked until they were directly in front of Paul’s cell. Keys jingled on a keyring for just a moment, but none ever appeared inside the lock. The door remained closed. Almost immediately, the door unlocked. Paul barely had enough time to push against it and throw himself backwards, out of its way, before it opened. The silhouette of a large man, both in height and width, stood silent in the doorway. 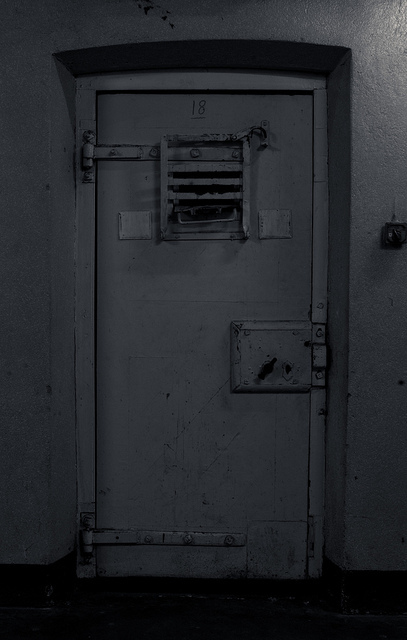 Although there were no visible lights behind him, his form remained black and featureless even as he stepped into Paul’s cell and closed the door behind him. The silhouette remained silent, but answered with a swift blow from its nightstick. The thick plastic connected with Paul’s left cheek, sending his head hurtling to the right as he flopped for balance. An explosion of excruciating pain erupted throughout Paul’s body, and he barely had enough time to instinctively look back up as the nightstick came down a second time. The air in the author’s lungs rushed out and he gasped for breath, desperately trying to find his voice to scream, plead, and beg the silhouette to stop. Go on, get up. Fight back! Another voice roared, echoing inside Paul’s mind. The voice was that of Ryan Lin, an enigmatic assassin he’d created years ago for a thriller his publisher had been pushing him for. It’s him or you! Kill him! Paul meekly looked up. He was seeing double. The silhouettes raised their nightsticks above their head, preparing for a final blow. Feebly, Paul held out a hand in a futile attempt to protect himself. One silhouette swung downwards, striking Paul behind his ear. The second silhouette struck the author on his upper arm. A flurry of blows rained down and all Paul could do was to curl into a ball and cover his head with both arms. Too late for you, the assassin moaned. I knew you didn’t have it in you. I don’t know why the Giver chose to bless a weakling like you. You’re worthless! Paul’s memory flashed back to his first time writing after the Meeting. He was skeptical at first, but was quick to test whether or not his new power was real. He hadn’t had anything to write, so he looked around his cramped writing quarters for inspiration. Upon the wall hung a small Polaroid of his late wife, Alice. She’d always encouraged him to take the plunge, do what he enjoyed, and become a writer—even if it meant he’d quit his current job and bring home less bacon. We have each other, she had said to him, and that’s all that really matters. And so he did it. And they struggled to pay the bills, but they got by. But most importantly, they had each other. Until she died. He was on the phone with her when it happened: the screech of metal clashing against metal, Alice’s scream—oh, that scream!—as she was thrown through the windshield, and finally, nothing but static. Paul had screamed back, first in surprise, but then overcome in dread. He knew something terrible had happened to his wife, but screamed for her nonetheless. Memories of Alice consumed him, and he became reclusive, unbalanced. His health suffered, but his writing did not. Suddenly he had something to write about, and also a medium to speak in. His therapist had told him not to keep his emotions bottled up; writing was the perfect outlet. So when Paul was looking for something to write about and test his newfound abilities as the Author, he wrote about Alice. He rewrote the events that happened too quickly that night. He rewrote the end of her story. All night he wrote, with tears dripping from his cheeks down to his clunky, black laptop keyboard. Only when a knock at the door interrupted his train of thought did he stop and get up. He opened the door slowly and peered out, unsure of why anyone would be visiting him at this time of day, let alone at all. The door wasn’t open more than a few inches when his heart skipped a beat and he gasped for breath. Paul merely shook his head, unable to form words. Alice entered the house and fell onto the couch, sighing in comfort as she leaned her head back to rest. Paul’s legs were rubber, but he managed to stumble over to the couch and sit next to his wife. She told him everything that had happened, and he listened intently even though he already knew. Everything he had written—every little detail—had come true. Suddenly, he no longer had any doubts about his Gift. You can’t tell Alice yet. A young woman he’d written about recently spoke excitedly to him from within his mind. Use it to your advantage. You can do anything, make anything! Create her something wonderful! She’ll love you forever! For once, Paul agreed with one of the voices. He wrote another story, this time depicting a romantic evening between the two lovers. Their meager house had transformed into an extravagant wonderland lit by impossibly tall candles and luminescent waterfalls. The house was a dream come true. They lived like that for months, with Paul creating wondrous things and Alice never questioning where they came from or even how they were possible. Paul had even begun to forget that he had ever lost Alice at all. Or maybe it was a subconscious repression. Either way, he had grown accustomed to having her back. But eventually, she started asking questions. You’ve given me a dream come true, she’d said, but we can’t dream forever. We have to wake up sometime, Paul. You know as well as I do it’s true. Paul tried to reassure her, to persuade her, that the life she was living with him was no dream, but she wouldn’t listen. He was never really that good at words, unless he had the time to rework and revise them. He knew they’d lived the dream, but he also saw the truth in her words: they had to wake up sometime. And so he began to write ordinary stories depicting the average couple. He and Alice lived in their average home and worked common jobs and cooked average food for dinner. She finally believed she had woken up. However, writing the prosaic iterations each day was a heavy chore on Paul. Some nights he’d sneak out of bed after she’d gone to sleep just to write through the night. He was always careful to slip into bed quietly before she awoke, but soon the side-effects of his insomnia began to show. He knew he had to do something about it, so some days he just didn’t write anything. Those days he slept through, as nobody else was around to wake him. A nightstick smashed against Paul’s jaw, jerking him back to the present. His head flew sideways like a ragdoll, but the damage had been done. He spoke, slurred in pain and blood: “Anything you want—I can give you anything. Just please, please! Stop; let me, give me a pen—anything, please!” Sobbing, Paul’s speech degenerated into incomprehensible gasps and moans. The door opened. Immediately, the author looked up, expecting to see the silhouettes retreating. Instead, he saw three men in suits—brown, black, and black—cautiously entering the room. “This is the one?” the man in the brown suit questioned, looking down at Paul, who was curled into a ball on his side on the cold floor. Paul tried to say something, but it came out as an inaudible moan. “How much do you want for him,” the man in a brown suit asked suddenly, “in his current condition?” He was handed a clipboard one of the others had been holding. He waited until the door had closed behind the two men, and then Brownsuit ducked down to eye-level with Paul. Slowly, he reached a hand outwards, but the distraught man on the floor shifted away.